Some facts about the race that could probably be regarded as fascinating or as trivia depending on how relevant/important/interesting you think they are. Over the years since 1967 there have been a total of ten guest teams permitted to compete in the race fourteen times. I say teams and not clubs because there were ‘select’ teams which ran in the mid eighties. Initially the guest teams were Irish and then there was a Norwegian team racing followed by three American teams and finally in 1997 there was an English club in the race. The clubs and their places in the race were as follows. 1996: Bedford and County 15th; 1997: Bedford and County 11th. The Kangaroos were a select rather than a proper club and were made up of American athletes on holiday in Europe. They won the race by 43 seconds from Edinburgh Southern Harriers. Fortunately, as guests they were not permitted to take the trophy which was awarded to ESH. A Norwegian who was a student at Strathclyde University and had run in the race for the University asked for permission after he returned home. Permission was granted and that was the start of their involvement which led to their being the only guest team other than the Kangaroos to finish in the first three. One of the problems that the Select faced was that any runner who was performing well one year ended up racing for a bigger club the following year. Nevertheless being only once out of the first fifteen over a longish period was no small feat. Heaton Harriers has a question mark because it might well be an English team – is Heaton not in Geordieland? The team competed before the War and I don’t know anything about it. Not knowing the truth of the matter, I’ve left it in. Shettleston Harriers raced most often with 59 appearances out of the 60: a fantastic record. Clydesdale Harriers had 53 races. 3. Springburn had 52 appearances. 4. Edinburgh Southern had 51 up to 1995. Two notes: (1) If you add the races from 1995 as being ESH, then they had 58 appearances. (2) Victoria Park first ran the race in 1939 and had 52 appearances. Were the fields in every race available, then the totals would be different but the pattern would probably have been identical. The clubs taking part in the first race were Bellahouston Harriers, Canon AC, Clydesdale Harriers, Dumbarton AC, Dundee Thistle Harriers, Edinburgh Northern Harriers, Edinburgh Southern Harriers, Hamilton Harriers, Garscube Harriers, Irvine YMCA, Maryhill Harriers, Monkland Harriers, Motherwell YMCA, Olympic Harriers, Plebeian Harriers, Shettleston Harriers, Springburn Harriers. Those in the last race were Aberdeen AAC, Calderglen Harriers, Cambuslang Harriers, Central AAC, City of Edinburgh, Clydesdale Harriers, Corstorphine AAC, Dundee Hawkhill Harriers, Falkirk Victoria Harriers, Fife AC, Hunters Bog Trotters, Inverclyde AC, Irvine AC, Kilbarchan AC, Law and District AC, Lothian AC, Metro Aberdeen, Mizuno AC, Shettleston Harriers, Victoria Park AAC. There were two races held in 1933, both won by Plebeian Harriers from Dundee Thistle Harriers; in the first one Maryhill was third club but they were only sixth next time round with Edinburgh Northern being third. There were also two in 1949. In April Shettleston won by over five minutes from Victoria Park with Bellahouston third. In November, Shettleston won again from Victoria Park but this time by only 70 seconds with Bellahouston Harriers third again. The last accident that I know about was in 1960 when Ken Ballantyne of Edinburgh Southern was knocked down when running in second place on the last stage. Although taken to hospital he was not seriously injured. The biggest winning margin was in 1952 when Victoria Park defeated Shettleston in a winning time of 3:48:44 to 3:55:10. The gap was a huge six minutes 26 seconds. In the 50’s the biggest rivals were the three Glasgow clubs of Bellahouston, Shettleston and Victoria Park but the biggest margins were between VP and Shettleston. 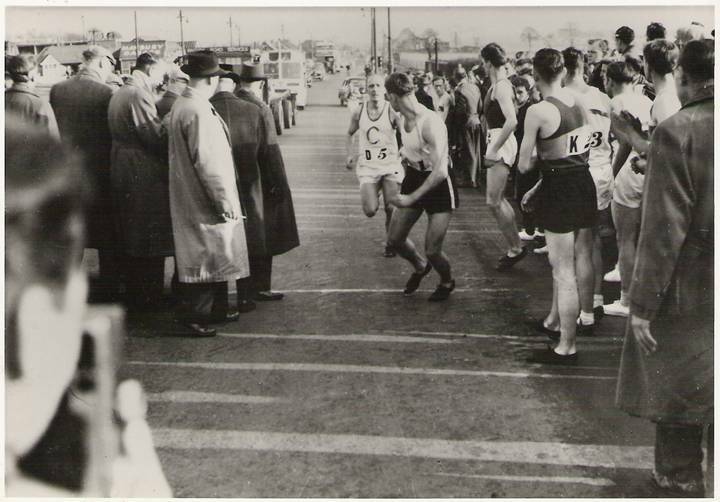 The second widest margin was also between Victoria Park and Shettleston but this time Shettleston won in 4:15:25 to their rivals’ 4:20:56 in 1949 for a gap of five minutes 31 seconds. The narrowest winning margin was in 1990 when Falkirk Victoria crossed the finishing line in 3:58:19 ahead of Dundee Hawkhill’s 3:58:23 – a mere 4 seconds after racing the width of Scotland! The next narrowest was in 1959 when Shettleston ran 3:53:39 ahead of Edinburgh Southern’s 3:53:52 which gave them victory by only 13 seconds. There were two victories with only 18 seconds between them – in 1959 when Shettleston defeated Bellahouston and in 1939 when Bellahouston was ahead of Maryhill Harriers. The smallest field ever to compete was in 1933 when only thirteen clubs turned out in the race. In 1945 and 1949 there were only fifteen teams forward. The biggest fields is a more complicated story. There were 22 in 1949 (two races that year) and then through the eighties when the fashion was to invite guest teams or to agree to requests from clubs/teams from outwith Scotland to run, the organisers agreed to allow a North District Select to run as well. So there many times when there were 21 teams out (20 + the North District) and several when there were 22 teams (20 + North + invited foreign team). There were 22 teams in the race in 1984, 1986, 1988, 1989 and 1992. Then in 1998 there were again 22 clubs in the race all home grown. I know that Garscube asked for an invitation because it was their Centenary Year and they had run in the first E-G but have no idea why there were another 21. There were also 22 Scottish clubs in the race in 1999 and I don’t know why that was either! At one time it was suggested that if you wanted to get a medal in the E-G then having blue in your colours would be a definite way to shorten the odds – certainly many of the most successful clubs such as Shettleston, Bellahouston, Victoria Park and Edinburgh Southern have worn the colour somewhere on their uniform. It started me thinking about the various styles and colours worn by competing clubs. There have only been two clubs to my knowledge who have worn a hooped vest and both began with the letter V. Vale of Leven with red and white hoops and Victoria Park with blue and white. Several clubs had a plain vest with two hoops round the chest including Edinburgh Southern (two blue), Lochaber also have a white vest with two blue hoops, City of Edinburgh (Blue and black), Aberdeen (two red), East Kilbride (two black on yellow) and Babcock’s with two black hoops. St Andrew’s University had a variation on the theme with a white vest and a dainty little cross of St Andrew centre front between the hoops. There were also two clubs with the big St Andrew’s cross – Bellahouston with a white cross on blue and Ayr Seaforth with a red cross on white. Vertical stripes were not worn by many clubs either – Calderglen with yellow and black vertical stripes, Spango Valley were in blue and yellow vertical stripes and Inverclyde AAC have black and white. Diagonals were worn by Edinburgh AC (two black diagonals on white), Kilmarnock (two white diagonals on blue), Monkland Harriers (white diagonal on black) and Inverness (a solid maroon diagonal on yellow). As for letters, well they were once quite popular although two of them which never made the E-G were Auchmountain with a capital A on a blue vest and Tayside with a large black T on a blue vest. However Clydesdale with the black C on white (adopted in 1911), Glasgow University (yellow G on black) and Westerlands (black W on yellow). Some vests had sandwiches on them. Law and District had a yellow vest with narrow red, white and red hoops round the middle and Greenock Glenpark had blue vests with a dark blue and yellow sandwich. Glasgow Police AAC had a white vest with a black and yellow sandwich and Kirkintilloch Olympians were one slice short of a sandwich with a blue vest and one black hoop and one white hoop. When it comes to vests with a large central bar round the vest there is a real proliferation and many were mirror images of others (Kilbarchan being yellow with a black bar and Falkirk Victoria having a yellow bar on black), some were virtually indistinguishable from each other. For instance Garscube (whose colours were originally chocolate and blue) had a white vest with a blue bar and ran in same races as Irvine YMCA who wore white with a blue bar AND a red triangle.. Very few had black as the main colour – Beith had black with a white bar, Dumbarton had black with a red bar while Greenock Wellpark had the negative of the Beith vest – white with a black bar. The Borders clubs had quirky vests – quirky in that they seemed to go against what their town colours were! Gala had a white vest with green bar (but their local rugby club wore maroon jerseys) and Teviotdale had white with a maroon bar (their local rugby club wore green!) Shettleston of course had blue with a yellow bar and Paisley had blue with a red bar. Cambuslang Harriers have a red vest with a broad white band and Fife AC have a white vest with a red bar. Vests which are original are few and far between but Dundee Hawkhill’s blue and white quarters has a long and proud history although Stirling University had green and white quarters. Dundee Thistle had a large white thistle centrally placed on the front of their vest and the Haddington East Lothian Pacemarkers had a red and white ‘half horizontal vest’. Livingston had their yellow vest with a single yellow stripe running up the left side. Vests composed largely of a single colour, with or without trim, were also well represented. Aberdeen University with their yellow, Hunters Bog Trotters in brown and Forres in red; Maryhill and Springburn each had their blue vest with their club badge sewn on – Springburn’s centrally and Maryhill over the left breast. Motherwell had black, Edinburgh Eastern had white. Corstorphine has white with black side panels while Central has yellow with blue side panels. The list is not meant to be exhaustive but is an illustration of the many sets of club colours and designs that have graced the race over the years. Mention should probably also be made of the club with most changes of racing colours: that honour goes to Edinburgh/Reebok/Leslie Deans/Mizuno Racing Club which changed its name with each new sponsor and changed its colours at the same time – that would be four different uniforms between 1991 and 2004. The status of the race can be seen by the number of Olympic athletes who took part – on one occasion Ian Stewart and Fergus Murray battled it out head to head on behalf of Aberdeen AAC and Edinburgh University on the second stage. Those Olympians that I know of are Dunky Wright (1928, 1932) and Donald Robertson (1936) of Maryhill; Bobby Graham of Motherwell YMCA and Maryhill Harriers ran in the Berlin Olympics of 1936 and all three of Wright, Robertson and Graham ran in the first ever E-G race in 1930; Jim Alder was in the marathon in Mexico in 1968 and ran for EAC in the E-G; 1972 was a bumper year for the race in the Olympics with Ian McCafferty (Motherwell), Ian Stewart, Lachie Stewart (Shettleston) and Donald McGregor (ESH) all competing in the Games; Frank Clement was a memorable fourth in the Mexico 1500 being only 0.4 seconds behind the winner; and John Graham (Clyde Valley) ran in the Los Angeles Olympics in 1984. Although not a Scotsman, Gareth Bryan Jones of Edinburgh University and Edinburgh Southern competed for Britain in the 1968 Olympics in Mexico City. There is no contest for the most appearances – Colin Youngson with thirty appearances in the race for five clubs takes the accolades for that. His five clubs were Aberdeen University, Victoria Park, Edinburgh Southern, Aberdeen and Metro Aberdeen. As far as medals are concerned, he has thirteen including seven golds! There are another two runners with thirteen medals and they are David Ross and John Robson of the famous (notorious?) Racing Clubs who have more in the way of golds than he has. I suppose that in a peculiar kind of way, as members of Edinburgh Racing Club, Reebok RC, Leslie Deans RC and Mizuno RC plus their original affiliations with ESH they could also have claimed five clubs. Maybe that’s challenging logic too far – logic to the point of illogicality! In any case, David Ross had 11 golds plus a silver and bronze with ESH and John had 10 golds (7 with the various Racing Clubs plus three from ESH) plus two silvers and a bronze from ESH days. Bert Irvine of Bellahouston Harriers was one of the first people that I ever heard of from outwith our own club in connection with the race. He lived in Drumore on the furthest out bit of Galloway at Luce Bay and couldn’t get up to races too often. It was said that he only ever ran in three races every year – the E-G, the National and the International! He was a very talented all round sportsman but along with guys like Binnie, McGhee and company he was a class athlete.